The story of W.B. Yeats’s tower, Lady Gregory’s autograph tree, and the grave of Irish airman Robert Gregory, whose death inspired some of Yeats’s most well-known poems. January 23, 2018, marked the 100th anniversary of the death in Italy of Ireland’s most famous aviator, Major Robert Gregory. 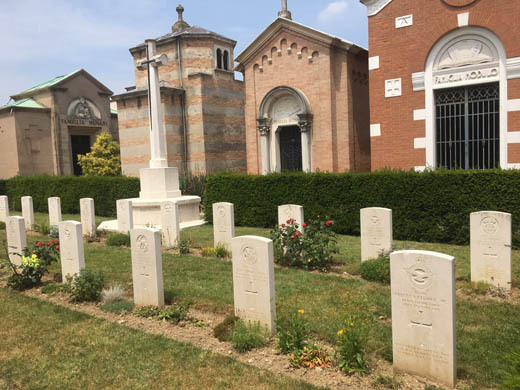 His grave stands in a quiet corner of Padua’s elaborate Cimitero Maggiore in a well-maintained section distinguished by its symmetry and simplicity. Twenty-five Commonwealth casualties of World War I are buried in this section, their white tablet headstones set in two rows. From behind, a white stone cross reaches 15 feet up, with a metal sword set on its front and those all-too familiar words, “Their Name Liveth Forevermore,” carved into its base. A box hedge surrounds the plot, and a row of mature thuja trees stands opposite, shading a bench where visitors can reflect on the consequences of the Great War or pay their respects to those interred here. Gregory’s grave stands at the far right of the first row. The balanced order of the plot reminded me of the balanced order in “An Irish Airman Foresees his Death,” the poem in which William Butler Yeats gave lasting voice to Robert Gregory. Symmetrically divided into two equal parts by its two periods, the halves are themselves divided into two stanza-like quarters, each four lines long, each rhyming a-b-a-b, and each containing numerous antitheses. All work together to celebrate the “lonely impulse of delight,” the moment of balanced stillness that ends the poem. Only Child of Late Rt. Hon. Lady Gregory was born Isabella Augusta Persse on March 15, 1852 at Roxborough House, seat of the wealthy and staunchly Protestant Persse family. The 12th of 16 children, she demonstrated from an early age not only an independent frame of mind, which soon enabled her to overcome the biases of her Ascendancy-class background, but also a practical sense of ambition, which eventually put her at the center of Ireland’s 20th-century literary revival. In childhood, Augusta showed an interest in romantic literature, particularly in the stories of mythical Irish heroes told by a nationalist nurse serving her unionist family. In her 20s, she gained invaluable experience managing Roxborough House and the estate for her brothers, 25 miles southeast of Galway, near the parish of Kiltartan. By the age of 27, however, Augusta’s prospects for marriage were dimming. Then she met Sir William Gregory, whose estate at Coole stood only six miles away. A widower, 35 years her senior, he had recently retired from his position as Governor of Ceylon, previously having served twice in the British House of Commons, first as Conservative M.P. for Dublin and then on a liberal-conservative platform for County Galway. Knighted in 1875 (thus the K.C.M.G. on his son’s headstone – Knight Commander of the Order of St. Michael and St. George), the politically imperialist Sir William was attracted to Augusta’s literary interests as well as to her management skills. They were married in 1880, and the following year their only child, Robert, was born. Throughout the 12 years of their marriage, the couple spent most of their time in London or abroad. After Sir William’s death in March 1892, however, Lady Gregory began to spend more time at Coole, which her husband’s will had left her to manage in trust for Robert, until he turned 21. In the challenging economic and political circumstances of the time (with land agitation and the struggle for Home Rule), this was no easy task. Coole was not a wealthy estate. 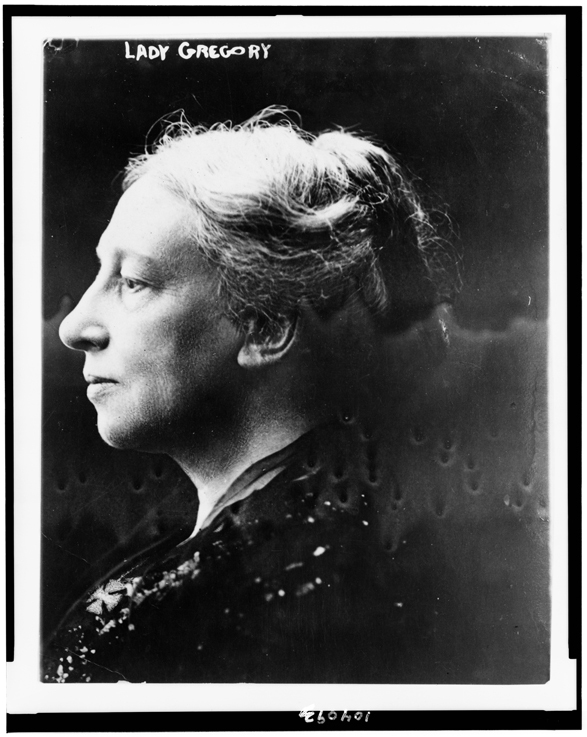 While Lady Gregory had to pay off debts, government measures required her to sell off lands to her tenants, thus reducing her income by half within 15 years. 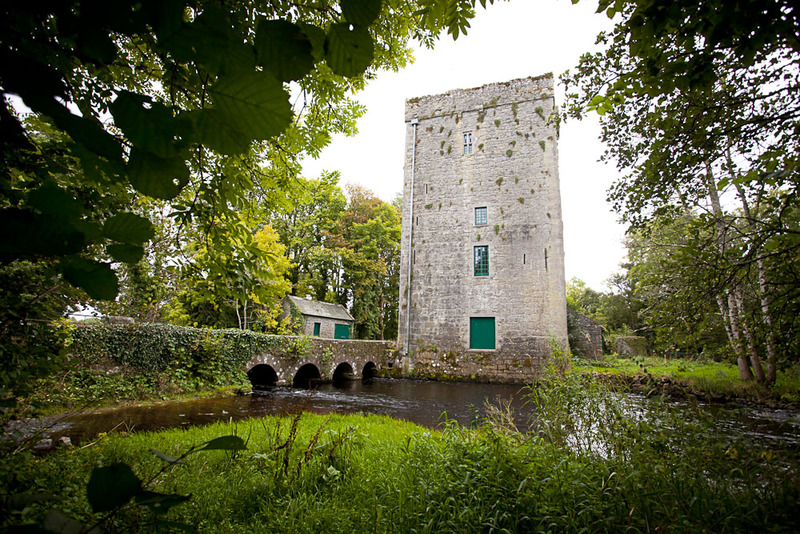 The Gregory lands included a 16th century Norman tower-house or castle keep, which had first caught the romantic imagination of William Butler Yeats in the last years of the 19th century. By then he had begun to spend his summers at Coole, initially collaborating with Lady Gregory on a collection of Irish folklore and fairy tales, then developing with her the idea of a national theatre, which would eventually become the Abbey, in Dublin. Yeats described his find as “the old square castle, Ballylee, inhabited by a farmer and his wife, and a cottage where their daughter and son-in-law live, and a little mill with an old miller, and old ash-trees throwing green shadows upon a little river and great stepping stones.” In 1915, Lady Gregory suggested that he buy the tower, since the tenants now wanted just the land. Yeats feared it would prove too impractical for a 50-year-old bachelor. A year later, the abandoned tower having passed into the hands of the Congested Districts Board, Yeats nevertheless began negotiating to buy it. Another year later, confident that his intention to marry would soon be fulfilled, he purchased the tower (now in heavy disrepair), along with its attached cottage and a surrounding acre of land, for the price of only £35. The cost of restoring it would prove to be considerably more. A roof had to be added, floors rebuilt, windows and frames replaced, and the cottage expanded. 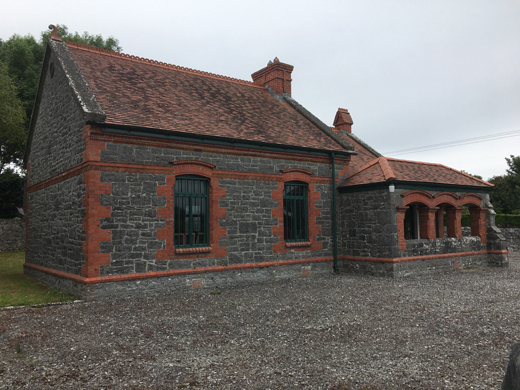 Having married Georgie Hyde-Lees during the interim (in October 1917), Yeats and his now-pregnant wife moved into the cottage in September 1918, while the tower continued to be restored. This would be, intermittently, the family’s summer home for the next 10 years. To announce their acquisition, Yeats reproduced as a postcard Robert Gregory’s drawing of the tower and its landscape. Entering through the thatched cottage, I am struck first by a sharp smell from the fireplace just inside: “a fire of turf in th’ancient tower” invoking the third line of “In Memory of Major Robert Gregory.” Here I meet Rena McAllen, who manages Thoor Ballylee (with a small team of volunteers and one paid employee) for about 4,000 visitors each season, from June through September. Soon after she welcomes me with a cup of tea brewed in the cottage’s kitchen, I realize that her local knowledge matches her energetic hospitality. Born and raised only a mile away, Rena guides me through Thoor Ballylee with as many references to its history during her lifetime as during Yeats’s residence. Not to be missed is the 12-minute video written by the late Yeats scholar, Augustine Martin. Featuring archival footage, it sets Thoor Ballylee in historical context, reaching not only back to the Norman invasion of Ireland, but also out to the political troubles during Yeats’s time here. The second floor, featuring a hooded fireplace and vaulted ceiling, served as the family’s living room, the third floor as Yeats’ and his wife’s bedroom. The fourth floor, the “strangers’ room” (where the couple may have intended to hold séances, in line with their occult interests) was never finished. A vent in the wall now houses 24 lesser horseshoe bats (a protected species, with only 600 remaining in Ireland). 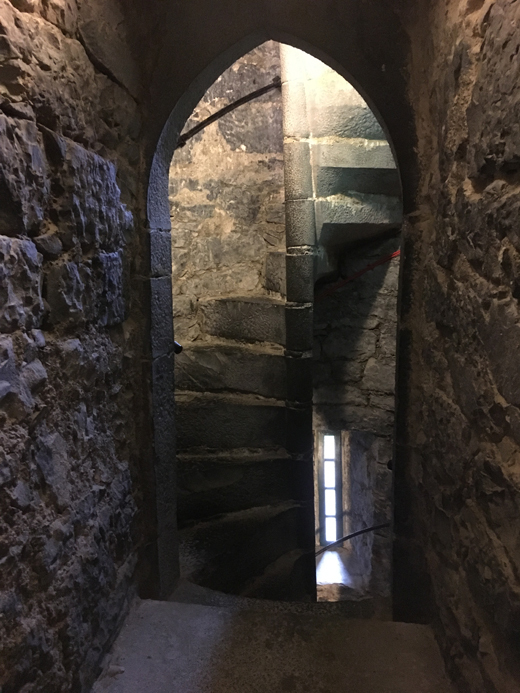 Similarly, a slit window off the winding stair contains a rook’s nest, reminding visitors of “The Stare’s Nest by My Window,” the penultimate section in Yeats’s “Meditations in Time of Civil War.” A final steep flight of stairs from the strangers’ room leads to the battlements, where Yeats would occasionally retire into the shadow of the large chimney, to escape horse-flies. 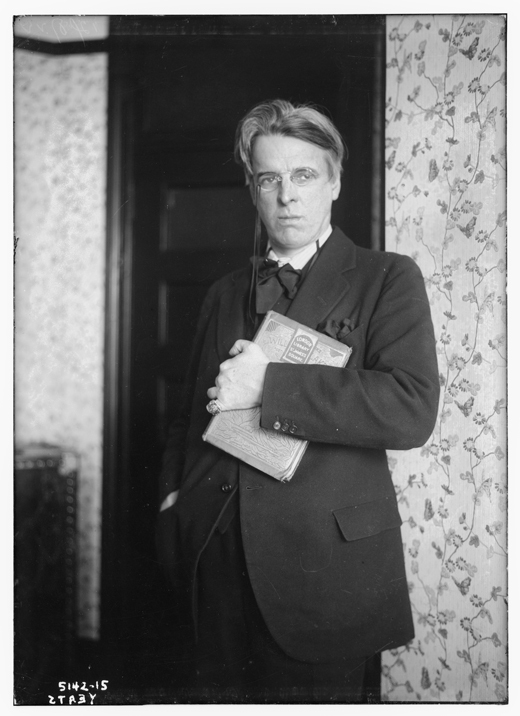 About the “Soldier,” however, Yeats has little to say, though Gregory embraced that role early in the Great War. At age 36 (and with three young children) he was officially too old to fly, but he would nevertheless win membership in the French Legion d’Honneur as well as the English Military Cross. Still, Yeats resisted even Lady Gregory’s “suggested eloquence about aero planes ‘& the blue Italian sky.’” Instead, he chose to portray Robert primarily as an artist. Gregory was an accomplished painter, too. By 1902 he had left Oxford to study at the Slade School of Art in London, where he met the fellow art student he would marry, Margaret Parry. The two then lived much of the time in Paris, or traveled abroad, in order to paint. Yeats admired Robert’s work so much that he asked him to design sets both for his mother’s plays and for his own at the Abbey Theatre. There was, however, considerable tension between the two men. Robert grew ever more resentful of the long periods of time that Yeats spent at Coole as Lady Gregory’s guest, where he occupied the master’s bedroom and had come to expect service. Though Robert had inherited the estate when he came of age in 1902, his father’s will had granted Lady Gregory residence throughout her lifetime. As for Yeats, he found Robert Gregory aimless and unreliable, showing little interest in the management of Coole and often failing to meet deadlines for his theatre sets. None of this personal tension makes its way into “In Memory of Major Robert Gregory.” The poem’s chief tension consists instead of the opposed demands that the active life and the contemplative life present for any artist, Yeats as well as Gregory. Three-quarters of the way from Thoor Ballylee to Coole Park lies Kiltartan Cross, the crossroads identified as Robert Gregory’s “country” in “An Irish Airman Foresees His Death.” Here stands the attractive Kiltartan Gregory Museum, built as a two-room schoolhouse in 1892 at the behest of Sir William Gregory and designed by the architect Frank Persse, Lady Gregory’s brother. Beautifully restored in the mid-1990s, its grey limestone walls with red-brick trim and open arcade now preserve both a historic classroom and a collection of artifacts associated with Lady Gregory. Of particular note is an illuminated address, hand-painted on parchment, in which the Gregory tenants welcome Robert as their future landlord on the occasion of his 21st birthday. Lady Gregory later wrote about this “gathering of cousins,” with “the big feast and dance of the tenants.” Reflecting on the tumultuous 30 years that followed, she poignantly added (near the end of her life): “But the days of landed gentry have passed. It is better so. Yet I wish some one of our own blood would after my death care enough for what has been a home for so long, to keep it open.” The collection at Gregory Kiltartan Museum also contains photographs of what she never saw: Coole House being pulled down in 1942, for building materials, its contents having been auctioned off in 1932, shortly after her death. Only the vestiges of the Gregory estate now remain. In accordance with the two-sentence will that Robert wrote in the train on his way to war, “everything I have” passed to his wife at his death. Margaret’s efforts to sell Coole began within just a few years, but they did not reach a conclusion until 1927, when the house and its surrounding land of seven woods were purchased by the Forestry Commission. The sale gave Lady Gregory the right to live there until her death, at the cost of £100 per year. Today, the demesne comprises a thousand acres of woods, river, turloughs (dry lakes), and bare limestone in the Coole / Garryland Nature Reserve. Trails provide access to the landscape that inspired not only Lady Gregory, Robert Gregory, and W. B. Yeats, but also his brother, the painter Jack B. Yeats. 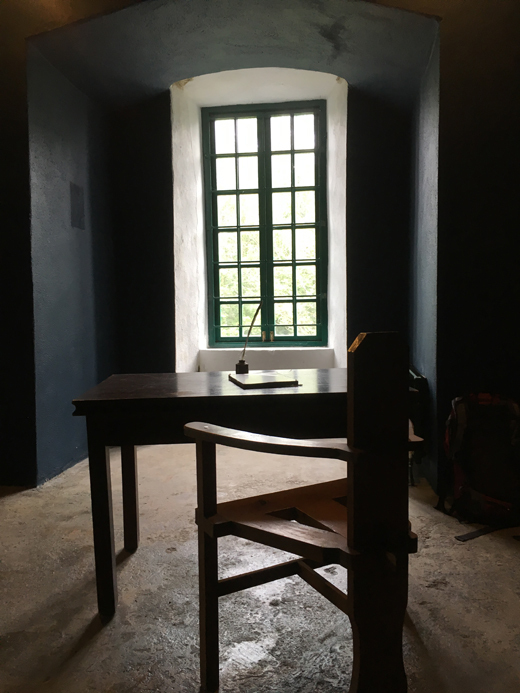 Here, too, visited the painter Augustus John and so many writers in the Irish Literary Revival of the early 20th century: George Bernard Shaw, J.M. Synge, George Russell (Æ), George Moore, Douglas Hyde, and Sean O’Casey. What were the stables and barn have now been converted into a visitor center. Be sure to purchase here Colin Smythe’s excellent A Guide to Coole Park. In addition to its informative text, it contains reproductions of paintings and drawings by Robert Gregory, Margaret Gregory, and Jack B. Yeats, as well as photographs of Lady Gregory, her house and estate, and her many literary visitors. Also, be sure to watch here the equally excellent 30-minute video, Lady Gregory of Coole, which surveys her life, relationships, and accomplishments. Philip Kokotailo is dean of faculty at the Roxbury Latin School in Boston, where he teaches English. The author of John Glassco’s Richer World: Memoirs of Montparnasse (ECW Press, 1988), he has a particular interest in the literature, art, and music of the early 20th century. Editor’s Note: This article was published in the February / March 2018 edition of Irish America Magazine. Thanks for this unique take on things. Was struck whilst reading it how things were strung together about the Tower. I was left reflecting then how much archetypal significance a la Tower was pressing in on us now, as say an astrologicak or other metaphysical commentary might speculate?